Speedball is an action game released for the Sega Master System in 1990. The game was followed by Speedball 2: Brutal Deluxe. 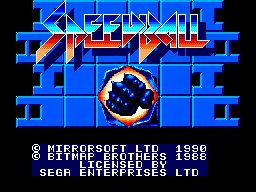 The Master System version of Speedball derives from the IBM PC version. Graphics were created in The Advanced OCP Art Studio for the Atari ST. Though the game was not released outside of PAL regions, Speedball on the Master System recognises an NTSC console and adjusts various factors (such as music speed) accordingly.